I used Mode Dea Silk 'N Wool blend on #10's. Each square took slightly less than one skein, which contained 154 yards, so the three squares took 3 skeins - around 450 yards, for an 18" X 4.5' shawl. To find out about Annie Payson Call, to whom this shawl is dedicated, see the previous entry. I knit the three squares separately then sewed them together. I have a thing about not wanting the crosses to be upside down. If you really hate piecing tho you can just start at the end and knit to the other in one long shawl. I'm sure it will look good that way too. To begin, cast on 59 stitches. 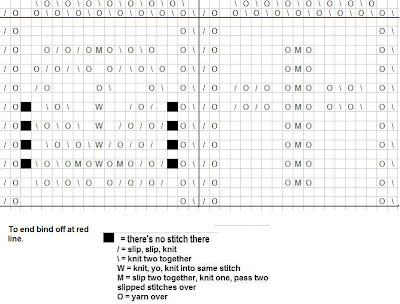 Knit a row, purl a row and you're ready for the pattern. I've just charted it because it's so straight forward. But do one stitch at the beginning and end of each row, knit on the knit side and purl on the purl side. I did the pattern like this - first repetition: cross, tulip, cross; second repetition: tulip, cross, tulip; third repetition: cross, tulip, cross. That made a square. If you want to continue, just keep staggering them. I guess this would make a nice afghan too if a group wanted to get each person to contribute a square. I love your work. Thanks for sharing it with us. You have inspired me! I really want to make this shawl for my ailing great-aunt but I'm confused about the "knit, yo, knit into same stitch" part. I googled and found no answer. Do I knit into the knit or the yo? Help!